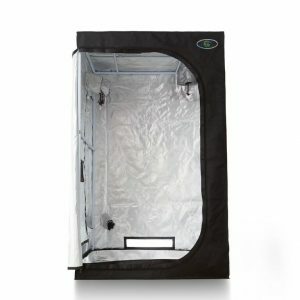 The Super Star is a 16 plant, all in one hydroponics stealth grow box system. The Super Star will provide a continual harvest since there are 2 separate chambers for flowering, cloning, vegging, and mothering. Grows 16 pounds of dried plant matter per year! Shipping: The Super Star ships via stealth shipping and will arrive at your door in 2-3 weeks after purchase. We will email you a tracking number upon shipment. The freight company will call you before dropping off the package to ensure someone is home. Shipping Cost: The Super Star ships for $295 via stealth, freight shipping. Note: The optional upgrades are not necessary. The Super Star base unit already comes with everything you need except for the plants. 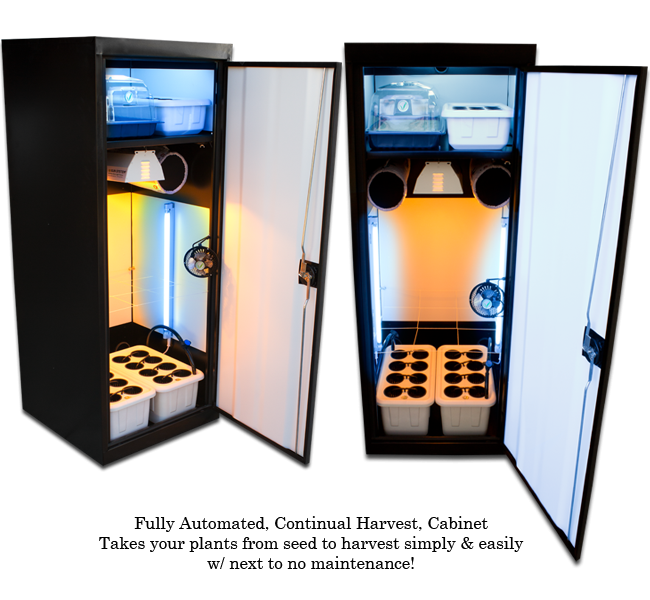 The Super Star is a fully automated grow system. The work involved is very limited as most of the work is done by the grow box itself. All you have to do is follow our simple instructions (paper and DVD instructions included) and the Super Star will handle the rest. 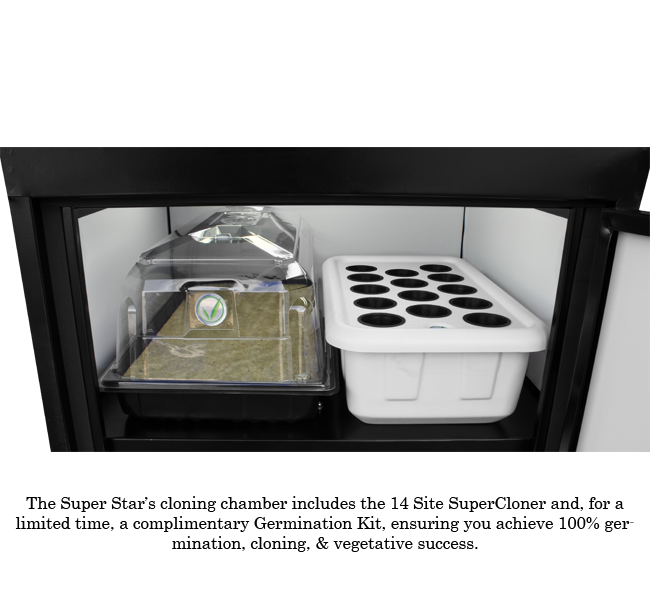 The cloning chamber has a 14 site area for germination, cloning, and early veg growth. It comes with two 24w T5, high output fluorescent bulbs. The veg/flower chamber holds 16 plants. The reservoir holds 8 gallons of nutrient rich water. 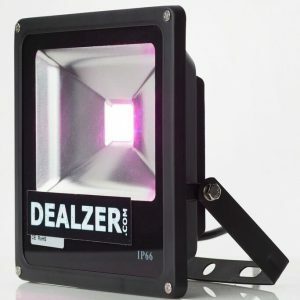 A 150w full spectrum lighting system is included. The system can also accommodate soil growers. The system comes with many more items but there are too many to list. 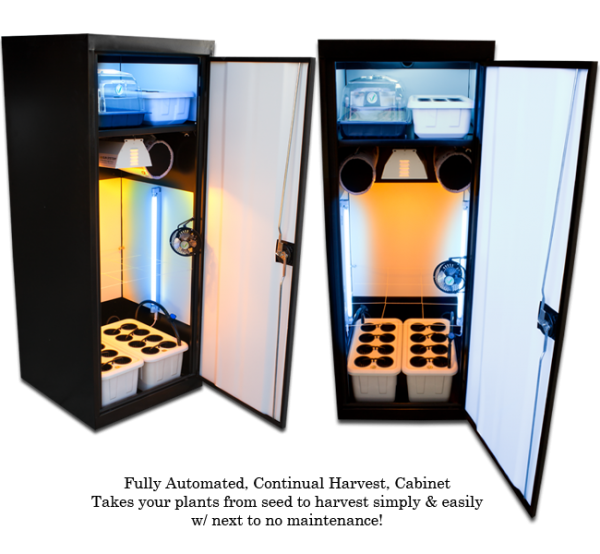 You will have everything you need to grow with the base hydroponic system. 250w HPS/MH Lighting and Ballast (for faster growth). 2. Co2 System – This will improve growth speed by 25%. 3. Procyon 100 LED lighting – This is a powerful LED light that will not only increase growth speed, but it will also use 90% less electricity and produce 90% less heat. this pack is a more professional version. 5. Germination Pack – This, like the nutrients, is a more professional media used for healthier plant growth. 6. Stealth Ro200 Water Filtration – Purifies your water to 99.999% purity. It is not a must, but this helps for healthier plant growth. 7. Sunglasses – This is to protect your eyes when growing. 8. 24-7 Nutrient Meter – Great tool used to test nutrient density in the water. 9. Ozonator – This will zap odor molecules from the air using a sophisticated odor control system. This along with the carbon filter will be an “overkill” for scent control! What Makes The Super Star Special? 3 Separate 110cfm Fans The strategy of using multiple small fans instead of one larger fan can help cut down on noise, while this more elaborate air handling system also helps with ventilation and keeping your grow area at the right temperature. Growers who have noticed problems with traditional single fans systems will love this multi-fan setup. Closed Loop Air-Cooled Lighting Having the air cooling system for your grow lights completely separate from other parts of your hydroponic kit helps to make sure that grow lights won’t burn or otherwise harm plants while also protecting against the loss of carbon dioxide and other effects that can happen when air cooling lighting systems are tied into exhaust systems. Having air cooled lighting and exhaust linked up is now seen as a kind of primitive way to set up a greenhouse or hydroponic garden, and so we have chosen systems that innovate with separate air cooled lighting systems to help with carbon dioxide distribution and help growers to more effectively control other aspects of air handling within their grow spaces. Cool Tube Reflector The cool tube for grow lights is something that effectively cools bulbs by focusing only on the local space directly around the bulb, instead of trying to cool the larger area. Systems without this kind of targeted cooling can be extremely ineffective and cost a lot more money. 4 inch Internal circulation Fan Using a smaller internal circulation fan provides plants in smaller grow cabinet with just the right gentle touch. While some beginners might think that more ventilation is a better way to go, larger fans and more powerful air circulation systems can actually harm plants by blowing air too hard in their direction. Passive internal air circulation is extremely important in the development of plants; it allows them to grow in a peaceful setting, as opposed to creating a wind storm. Lumatek Digital & Dimmable Ballasts Two of the main reasons that Lumatek ballasts are so important are reliability and versatility. These brand-name award-winning ballasts will give growers consistent lighting for healthy harvests, while also offering dimming technology to help growers micromanage the light that reaches their plants. Cheaper ballast can result in a less reliable setup that can leave growers scrambling if problems occur. 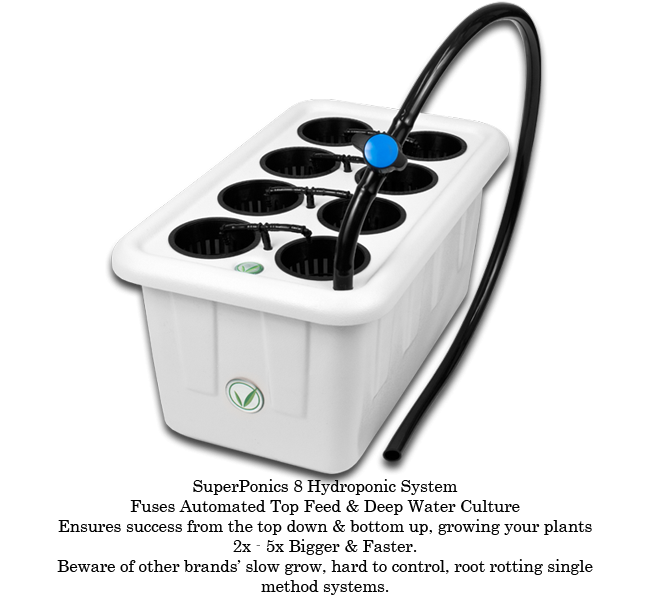 Superponics System Growers who have tried all kinds of hydroponics irrigation systems may have noticed some of the drawbacks of anyone single method. In order to really provide for a consistent and vibrant root feeding, our systems include SuperPonics double-irrigating systems that combine a top-down approach with an additional bottom-up design. 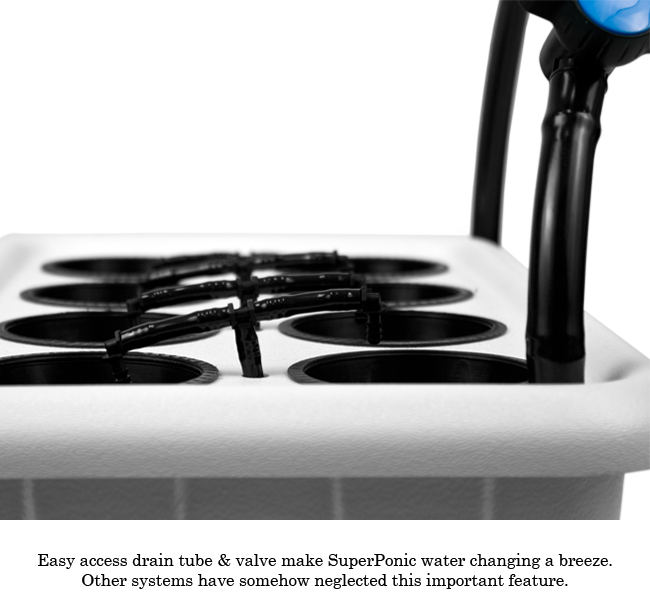 Combining Deepwater culture and a top speed drip system allows plants to get what they need in two ways, which ensures that nutrients get distributed to plants instead of ending up at the bottom of a reservoir or otherwise dissipating without having the intended effect. SuperPonics allows plants to grow bigger, faster, and with more safeguards against nutrient deficiencies. Custom Superponics UV Protected Plastic Reservoirs Another feature of these systems is thick, durable and well designed “food grade” plastics for reservoirs. Cheap plastics can degrade over time or suffer a range of other wear and tear issues including discoloration and cracking. By contrast, high quality plastics give hydroponics gardens the support of durable environments. 20 Gallon Custom Reservoir This grow system also includes a larger than usual reservoir which allows for better handling of issues including nutrient distribution, pH value monitoring, and total dissolved solids measurement. These bigger systems also allow growers to have more flexibility in their maintenance schedules for hydroponics gardens. They help reduce high yields and less labor-intensive plant cycles. Reusable Clay Hydroton Stones Hydroton provides an effective and long-lasting sanitary media for plants. While some other materials have to be replaced regularly, hydroton is reusable and offers support for multiple plant cycles. TechnaFlora Comprehensive Nutrient Program When it comes to nutrients, growers need a full range of products that deliver all of the best kinds of chemical elements to plants. Our multiple nutrient package system gives you all of the items you need in a simple package solution, with handy instructional materials that can help you understand what your plants need to grow in a soil-less environment. 18 Gauge “Infra Cool” Powder Coated Steel Cabinets Powder coated steel cabinets offer longevity and durability, along with a clean and secure grow environment. Using these secure materials provides for hydroponics kits that will support many plant cycles while looking good in interior spaces. Stable Cabinet We’ve developed our no-wheels system after talking to many growers about whether or not it’s good to have small wheels or casters on a grow cabinet. The overwhelming consensus is that wheels can be more of a nuisance than a real help when it comes to maintaining a hydroponic system, so these types of kits are simply floor-standing models that will stay where they are put. 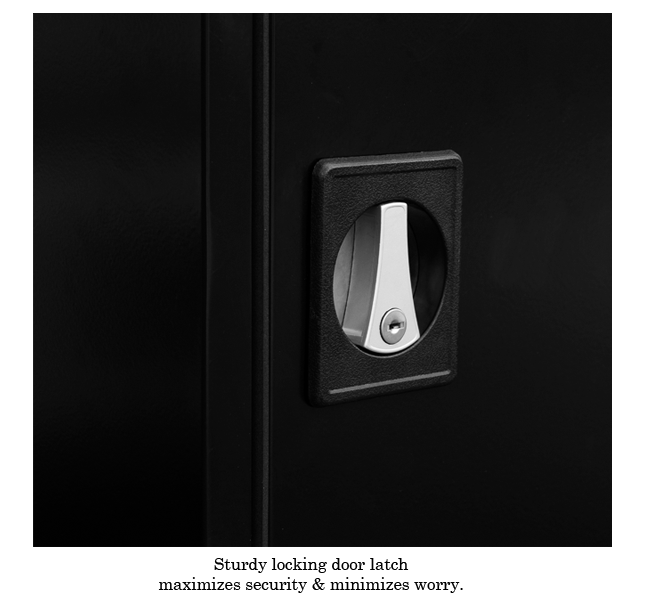 Triple Locking Doors Extra security features help growers to manage access to plants and prevent unauthorized access. Reflective Removable Magnetic Paneling The reason we integrated magnetic reflective panels into our designs is that simple mylar or other materials can get very dirty or discolored in the course of a plant cycle. These more temporary materials can also tear or otherwise get worn and need to be replaced. The removable magnetic panels offer the same kind of light distribution, but with an additional benefit: growers can take them out and clean them in between plant cycles which helps with overall sanitation. Liftetime Tech Support As with all of our grow systems, you will get a liftime of free tech support.